Berocca Performance is a multivitamin which contains a combination of B vitamins and vitamin C, as well as the minerals calcium, magnesium and zinc. The multivitamin contains no caffeine, sugar or other artificial stimulants, and is aimed at providing improved and long lasting mental and physical performance. One tablet of Berocca daily provides 15 mg of vitamin B1, also known as thiamine. The RDA for vitamin B1 is 1.2 mg daily for men and 1.1 mg daily for women. Vitamin B1 helps with energy production, athletic performance, may improve memory and mood and can strengthen the heart. It is essential for converting carbohydrates into energy. If you take in more than your body needs it will be excreted in your urine. Berocca daily multivitamin provides 15 mg of vitamin B2, also known as riboflavin. The RDA for vitamin B2 is 1.1 to 1.3 mg daily. Vitamin B2 can help prevent cataracts, reduce migraines, and may be beneficial for depression and mental functioning. It plays a role in thyroid production which speeds up metabolism in the body. Excess B2 intake is excreted in your urine. 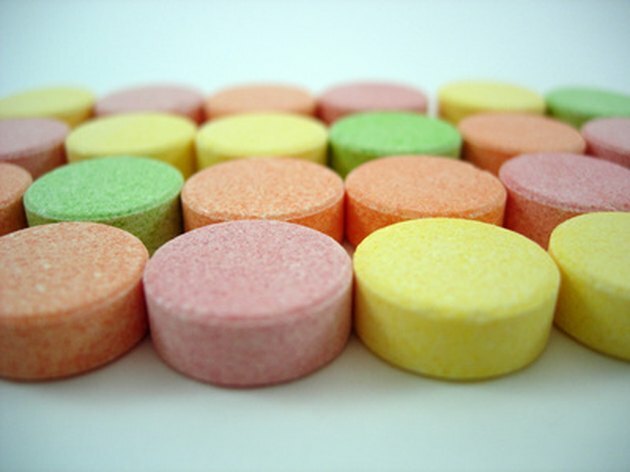 One tablet of Berocca contains 25 mg of Vitamin B3. The RDA for B3 is 14 to 16 mg per day. It is helpful for lowering cholesterol, improving circulation, easing arthritis symptoms and improving cognitive functioning. Too much may cause itchy and flushed skin, upset stomach and liver damage. Be sure to discuss your vitamin B3 intake with your doctor to determine your needs. The RDA for vitamin B6 is 1.3 mg for adults under 50 and 1.5 to1.7 mg for adults over 50. One tablet of Berocca daily provides 10 mg of vitamin B6. Vitamin B6 can help prevent heart disease and depression. It also helps cells to make proteins and release stored forms of energy from within the body. Doses of up to 100 mg daily are safe. Taking more than 2,000 mg daily can cause nerve damage. Also a B vitamin, folic acid is known to protect against birth defects, reduce risk of heart disease, lower cancer risk, heal wounds and build muscle. One tablet daily of Berocca provides 400 mcg folic acid. The RDA for folic acid is 400 mcg daily. Consuming over 5,000 mcg folic acid per day provides no additional benefits and may actually cause seizures in those with epilepsy. Vitamin B12 helps to fight fatigue, lower risk of heart disease, plays a role in producing DNA, and helps to convert food into energy. Berocca daily provides 10 mcg of vitamin B12. The RDA for vitamin B12 is 2.4 mcg per day. Excessive B12 intake is excreted by the body in your urine. One tablet of Berocca provides 150 mcg biotin per day. This is about half of the 300 mcg recommended daily biotin intake. Biotin helps the body more efficiently use carbohydrates, fats and proteins from food. It also helps promote healthy nails and hair. There are no known adverse effects from consuming high doses. Another B vitamin, panthothenic acid helps to promote healthy nervous system functioning and, like biotin, it helps the body use carbohydrates, fats and proteins from food. One tablet of Berocca provides 23 mg panthothenic acid. There is no RDA for panthothenic acid; however, an adequate intake level of 5 mg per day has been determined as enough to maintain body functioning. One daily tablet of Berocca provides 300 mg of vitamin C. The RDA for vitamin C is 75-90 mg a day. Vitamin C helps promote eye health, protect against heart disease and cancers, promotes wound healing and helps absorb iron from foods. Optimal intake is at least 200 mg per day to achieve these benefits. Consult your doctor to find out how much is right for you. Consuming more than 2,000 mg daily can cause upset stomach, diarrhea, and may interfere with absorption of some nutrients. "Guide to Drugs and Supplements"; Reader's Digest; 2007.